She sees the camera and forgets she’s sick. It’s amazing to me how much she looks like Maddie there. 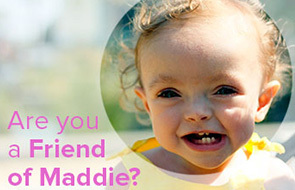 I mean comparing that pic to the main one of Maddie on the homepage – good lord, you’d think you were looking at twins! You are so right. They are right next to each other. They look alike so much. yes they do! twins! one with lighter hair…one with darker hair. I agree with Kayla. She looks so much like Maddie in this photo. Beautiful! What a beautiful picture. I love her smile! She’s adorable! Is that a tiny Girl Scout T shirt that she’s wearing? Is she the littlest Daisy Scout ever? Such a ham and that smile makes me smile!!! Love her! Love it! She looks so much like Maddie and both are so adorable!!! I, too, see a breathtaking resemblance to Maddie in this photo. I can’t believe she’s so happy in the waiting room! Such a cutie, even sick! Is that a girl scouts shirt she has on?!? Oh my goodness those cheeks! I can’t believe how truly adorable she is. Well then, keep that little diva on camera 24/7! She’s such a little ham! Well, hello there, pretty baby! I hope you feel better soon! Is that a Girl Scouts shirt? Because it is awesome. She is such a little sweetheart, I hope she feels better really, really soon!!! I agree, she looks so much like Maddie in this picture! Beautiful girls!